Michael put a pen in his shirt pocket. The shirt was white, so naturally, the pen leaked. Michael decided to salvage the shirt by dying the whole thing black, so he bought a package of Rit Dye -- black. He very carefully put it up high in a place where the animals wouldn't get at it. Tamarak was one to take such challenges personally, so the kitten found the package of dye and pawed it. She pushed and pulled and batted it around until she got it off the shelf down to where she could play with it. Then she batted it around the desktop until it fell on the floor. At this point, Tove decided to get in on the act. 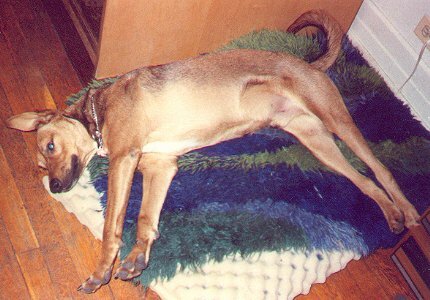 Now Tove was a dog that looked as if he was put together by a committee. And he was not overly blessed with brains. The dog thought that if the kitten liked to play with this strange new thing, it must be a great toy, so he took it up in his mouth and chewed it until the envelope of dye came open. Then he ran about the house, gracefully dripping dye granules all over. Two of the other cats investigated the piles of dye crystals. Then, losing interest, they sat down and licked their feet. Afterwords, they trotted off, with damp paws, over and through the dye crystals, leaving two sets of perfect, dark-blue kitty-prints on the white bedclothes. I walked into the room, saw what had happened and calmly screamed. Tove immediately figured something was wrong, so he started to back up, right into the dresser, knocking off the flowers onto the floor. Unfortunately they were cut flowers and I had remembered to water them just that morning. Flower water works as well as anything with dye crystals to make a wonderful dye which stains both wooden floors and linoleum very nicely. 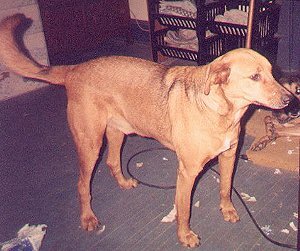 Tove, formerly a honey-colored brown dog, now had four black paws, a black front and tail, a black face and a very black tongue. I took Tove outside and chained him to the porch rail. I came back in and started cleaning up the dye. First I swept up the worst of it, but the bristles kept holding on to the dye, so I ended up just spreading it around further. So I tried vacuuming up what I could. The Vacuum took the dye nicely too. The floor head and the inner part of the hose were dyed black. Also probably the motor and the insides, but I decided not to investigate that. The floor was littered with paw prints, both canine and feline. So I started to mop. The more I mopped, the more I made dye. Soon the entire floor was several shades darker. The mop-head was now permanently black, the inside of the pink bucket was getting darker, and the tub where I was emptying the used water was turning grayer by the moment. My shoes had granules of dye all over them and when I stepped in some damp floor, I started to add my footprints to the decorations. I took off my shoes and washed the bottoms of them but then my feet got dirty. I washed my feet and dried them, but every step I took still left prints because the dye powder was so fine I could not avoid stepping in it, and then my feet would sweat, slightly, leaving still more footprints as well as dying my feet a very pretty dark blue. For a good hour and a half, I was making more mess than I was cleaning. Then it looked like I was starting to make headway. But Tove was still out on the porch, howling his unhappiness at being left out of the fun. I vacuumed him (which he took strong exception to) and then took him to the courtyard to hose him off, but the outside faucet wasn't working, so I had to take him to the basement laundry room. Buckets and buckets and buckets and buckets of water were poured over him. I figured that his fur was dyed until it grew out, but I wanted to get off whatever I could of the coal-like stuff. After about thirty minutes, the water seemed a little lighter. Twenty minutes later, I dunked his feet one at a time in the bucket and got no perceptible hue coming from the rinse. His mouth was harder to clean. His tongue was a lost cause, but the rest of his face and muzzle were still very dark. I was in less than a good mood and not much in charity with him by then, so I dunked his whole muzzle in the bucket of water. Although he was underwater for less than a second at a time, I must admit it did occur to me to keep him under for longer. I womanfully resisted the temptation. I wondered briefly if he would die from the dye, but alas, it was merely a vegetable dye. Exhausted by the battle, I climbed the stairs back to our apartment to survey the damage. The porch where Tove had been chained had not a single visible paw-print---it was solid black. Tove and I walked onto a bluish kitchen floor which had formerly been white. The wooden floor was decorated by paw prints of all kinds, we now had designer sheets, and a gray and white tile floor in the bathroom. The tub never did look the same and we needed a new mop. One can only assume that the Fates needed some comic relief that day. I figure, however, that there is a Moral to the story: A cat may have nine lives, but a dog dyes but once.